MAKAYLA Wonder Booster Kit (Age Delay Solution) is the perfect kit to fight premature ageing symptoms. Prevent your skin from getting fine lines & wrinkles too soon. 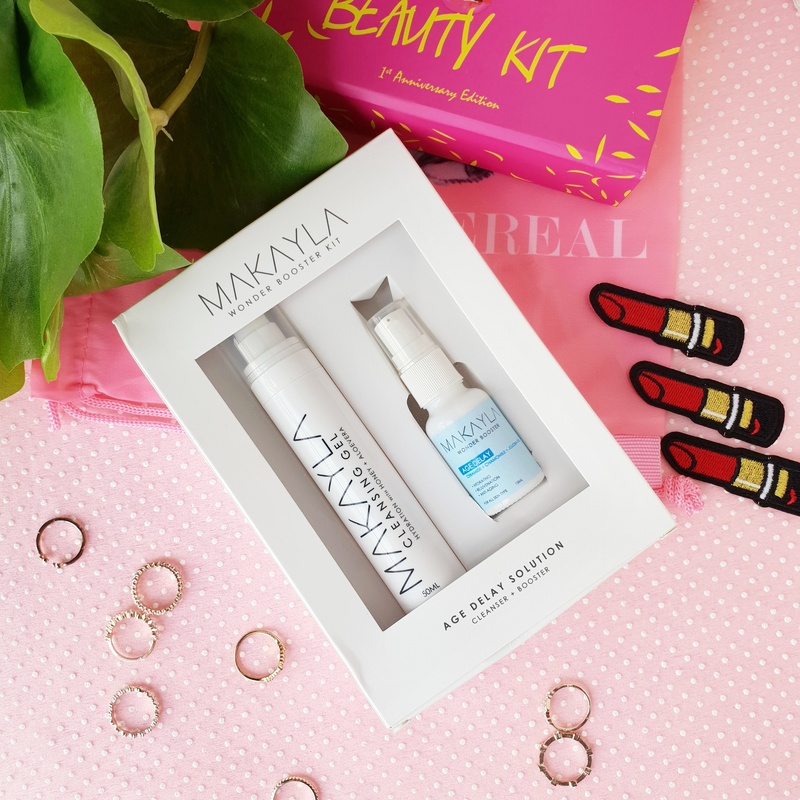 The kit comes with MAKAYLA Cleansing Gel as well. Enriched with Ceramide and Plant Extract, effectively improve the appearance of wrinkles, reduce pore size and improve skin tone. This light-weight, fluid booster combines retinol with antioxidants and peptides for a clearer, more radiant and younger-looking complexion. Gentle cleanser that contains built in moisturizing properties that cleanses the skin without stripping the skin of its natural oils. Active Honey and Aloe Vera help to soothe redness that can be associated with inflammation. A refreshing and non-irritant face wash suitable for all skin types. Age Delay Solution: Aqua, Hamamelis Virginiana (Witch Hazel) Extract, Methylsilanol Hydroxyproline Aspartate, Propylene Glycol, Glycerine, Caprylic/Capric Triglyceride, Chamomilla Recutita (Matricaria) Flower Extract, Ceramide 3, Achillea Millefolium Extract, Betula Alba Bark/Leaf Extract, Equisetum Arvense Leaf Extract, Rosmarinus Officinalis (Rosemary) Flower/Leaf/Stem Extract, Urtica Dioica (Nettle) Extract, Olea Europaea (Olive) Oil Unsaponifiables, Simmondsia Chinensis (Jojoba) Seed Oil, Hyrogenated Phosphatidylcholine, Butyrospermum Parkii Butter, Phytosterols, Glyceryl Caprylate, Aloe Barbadensis Leaf Juice, Maltodextrin, Sodium Hyaluronate, Trideceth-9, 1, 2-Hexanediol, Bisabolol, Caprylyl Glycol, Aminomethyl Propanol, Carbomer, PEG-40 Hydrogenated Castor Oil, Hydroxyethylcellulose, Phenoxyethanol, Ethylhexylglycerin. Cleansing Gel: Water, Sodium Laureth Sulfate, Cocamidopropylamine Oxide, Cocamidopropyl Betaine, Lauryl Glucoside, PEG-7 Glyceryl Cocoate, Propylene Glycol, Honey Extract, Sodium Chloride, Citric Acid, Diazolidinyl Urea, Aloe Barbadensis Leaf Juice, Methylparaben, Propylparaben, CI 15985, CI 19140, CI14700.